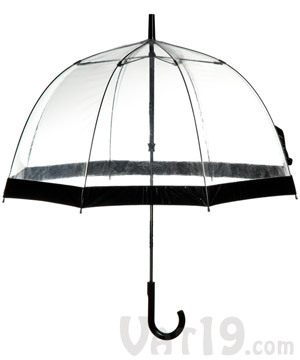 The Birdcage Umbrella by Fulton is a stylish "brolly" featuring a transparent domed canopy. Designed by the famed engineer and inventor Arnold Fulton, the Birdcage Umbrella has been a favorite of British Royalty for decades. 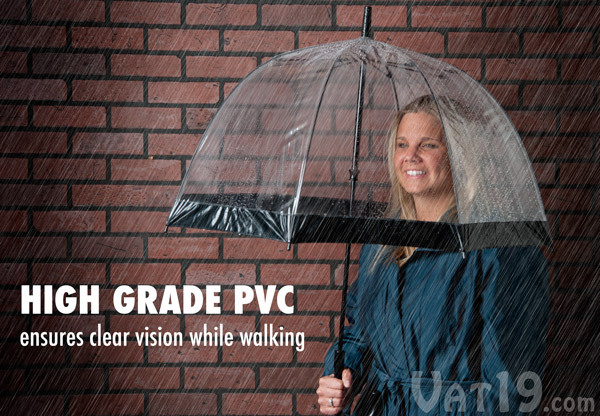 Its heavy-duty PVC outer covering provides clear visibility and its patented Easy Glide open and close mechanism treats your thumbs like the evolutionary wonder they are (and not like a dinner those other umbrellas try to devour). A flexible frame helps prevent wind damage. Available in adult and child sizes. In England, it rains nearly every other day. So, when it comes to brollies, the British need the best. Since 1956, that means umbrellas manufactured by Arnold Fulton (the largest supplier of umbrellas and rainwear accessories in the UK). Their stylish and iconic Birdcage design is a favorite amongst the Royal Family. The large canopy completely covers the head and shoulders while still providing clear visibility with its transparent PVC covering. The Fulton Birdcage Umbrella is a classic British design. The Queen of England loves this thing! Fulton supplies the Birdcage Umbrella to the Queen of England and is allowed to officially promote and advertise this relationship as "holding a Warrant to Her Majesty The Queen". This is the royal equivalent of a product endorsement and is a really big deal in England. 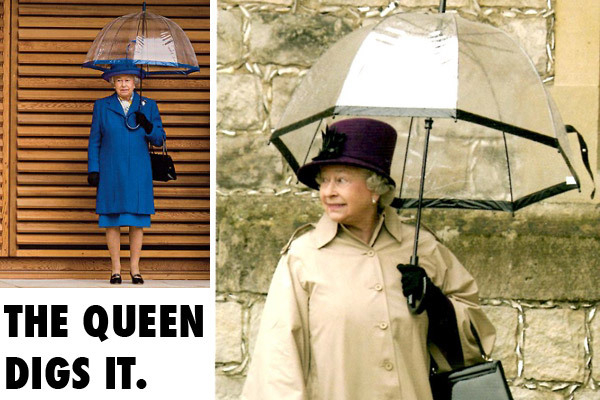 So, when we saw the Birdcage Umbrella and the fact that it's good enough for the Queen (who probably spends many a day greeting people outdoors), we decided to check it out. This ain't no cheap plastic umbrella. The Birdcage Umbrella is tough, sturdy, well-designed, and stylish. You shan't be disappointed, old chap! Fulton Birdcage Umbrellas are honored to hold a Royal Warrant to Her Majesty The Queen. Fulton invented and patented their Easy Glide Open & Close mechanism. 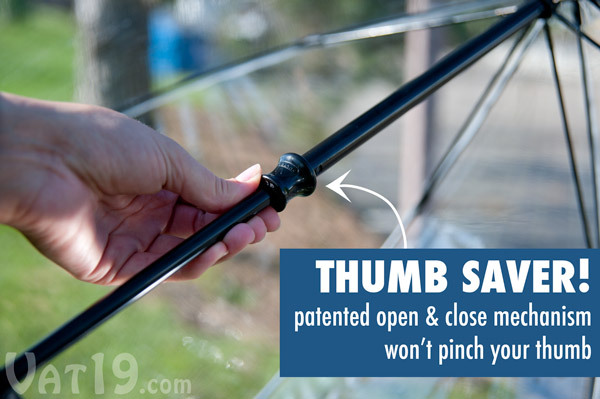 Instead of impaling your thumb on a thin piece of metal to collapse your umbrella, you simply slide the canopy open or closed. 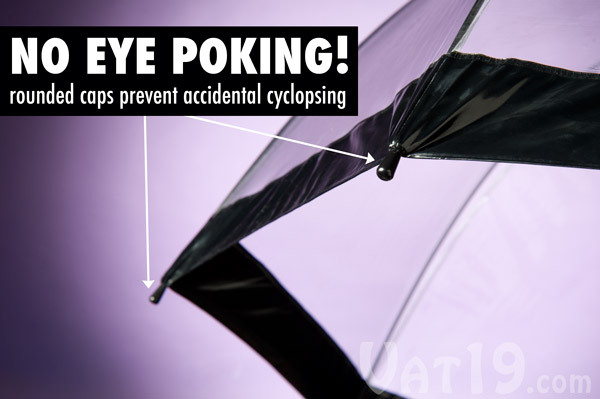 Because the action is so smooth, the whole umbrella doesn't jerk closed (threatening to take out your eye), but instead is easy, quick, and safe. Enjoy smooth, safe, and convenient opening and closing with Fulton's patented Easy Glide mechanism. Every Fulton umbrella is engineered to minimize the risk of damage in wind. By creating additional flexibility in the frame, stress on the ribs (as well as the potential for damage) is greatly reduced. 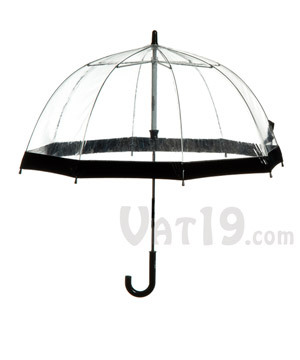 The adult version of the Birdcage Umbrella employs heavy duty fiberglass ribs. The child's version uses metal ribs. 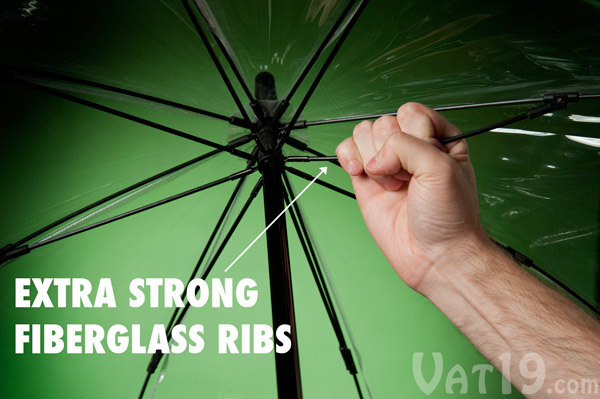 The adult version of the Birdcage Umbrella utilizes fiberglass ribs to make it resistant to wind damage. The caps at the end of an umbrella are called ferrules (learn something new everyday, right?). To prevent cyclopsing (yeah, it's a verb now), Fulton smartly made their ferrules from soft and rounded plastic. 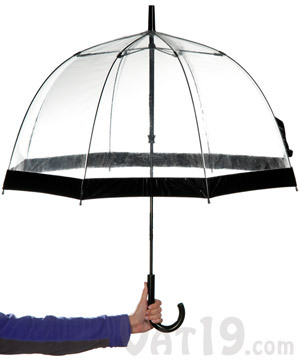 The tips of the Birdcage Umbrella are rounded and blunted to prevent poking. Kids' size is freakin' adorable! To little ones, the Birdcage Umbrella is like a portable pillow fort that keeps them dry in the rain. Kids completely geek out over this thing! And for parents, please imagine strolling down the road, holding your daughter's hand, and sporting matching Birdcage Umbrellas. It will look (and be) awesome. Guaranteed. 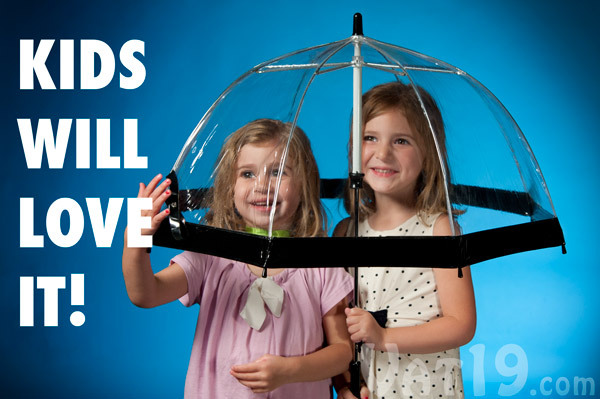 Kids are sure to love their very own domed umbrella. 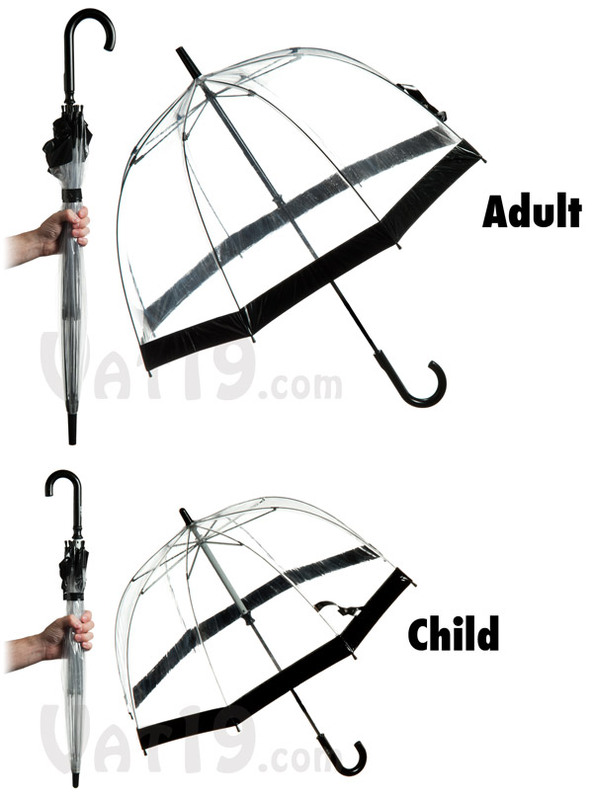 The Birdcage Umbrella is available in two sizes: adult and child. The specification differences are outlined below. Get one for you and for the kids. They're so cute!